Each strategic objective is comprised of between four and seven operational objectives. For example, the strategic objective on health systems includes operational objectives such as strengthening community responses and systems; strengthening health data systems; and strengthening financial management and oversight. And the strategic objective on human rights and gender equality includes operational objectives such as introducing and scaling up programs that remove human rights barriers to accessing services; and supporting the meaningful engagement of key and vulnerable populations and networks in Global Fund–related processes. The Global Fund Board undertook an extensive consultations process to help it come up with the new Strategy. This included three regional partnership forums and an online platform. In addition, the Technical Evaluation Reference Group commissioned a review of the current strategy as well as thematic reviews in areas such as health systems, challenging operating environments, and market shaping. The new Strategy is a high-level document. It will be operationalized through detailed strategy implementation plans. These will be developed by the Secretariat and submitted to the Strategy Committee for review. The four strategic objectives are underpinned by what The Global Fund calls “strategic enablers” – i.e. (a) innovating and differentiating along the development continuum; and (b) supporting mutually accountable partnerships. 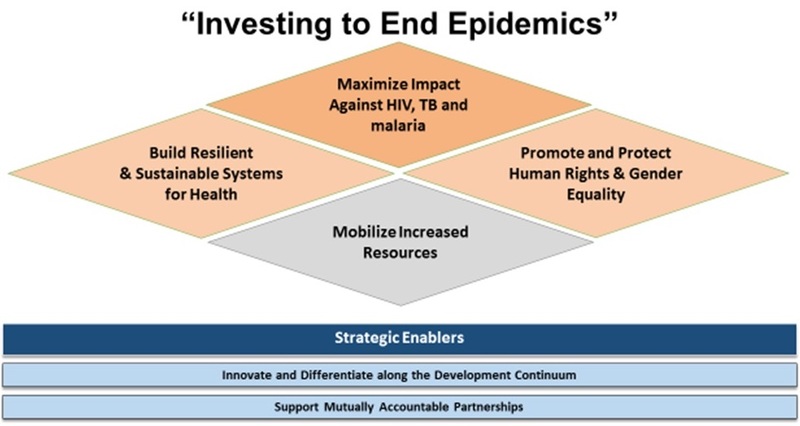 Concerning differentiation, the Strategy calls for the The Global Fund to tailor its approach to the disease burden and income level of a country, and also to take into account other factors, including: epidemiologic and other socio-political contextual dimensions; financing gaps; fiscal space; absorptive capacity; risk; and where and how the Global Fund (with partners) can have the most catalytic impact. Differentiation also means that The Global Fund will evolve the way it operates to respond more effectively to the diverse range of contexts where its grants are implemented. Partnership has always been a cornerstone of The Global Fund’s approach. The new Strategy will build on that model to achieve impact at country-level. This includes, for example, engaging with technical partners to provide support to national strategy planning processes; and with the private sector to foster innovative approaches. The Strategy says that civil society and community groups will continue to be instrumental (a) as advocates for increased funding for the Global Fund, for health, and for the three diseases, to hold their governments accountable; and (b) to deliver of high quality services for hard to reach populations. The Strategy also includes a section on goals and targets aligned to the global plans of the Fund’s main partners. Targets and indicators for this section of the Strategy are currently under development with the partners. Finally, achievement of the strategic goals and targets will be measured through key performance indicators. A new KPI framework will be proposed to the Board shortly. Editor’s note: GFO is preparing separate articles on each of the four strategic objectives. The first of these articles is included in this issue of GFO. The other three articles will appear in upcoming issues. The Global Fund Strategy 2017-2022: Investing to End Epidemics, Board Document GF-B35/02, should be available shortly at www.theglobalfund.org/en/board/meetings/35.